Baked tofu is a quick and easy plant-based protein that tastes great! It comes together so easily: just whisk together a marinade, soak the tofu, spread the tofu on a pan, bake and enjoy! It comes out of the oven crispy, flavorful, and ready to add some zing to salads, noodle (or zoodle) bowls, sandwiches, and more. 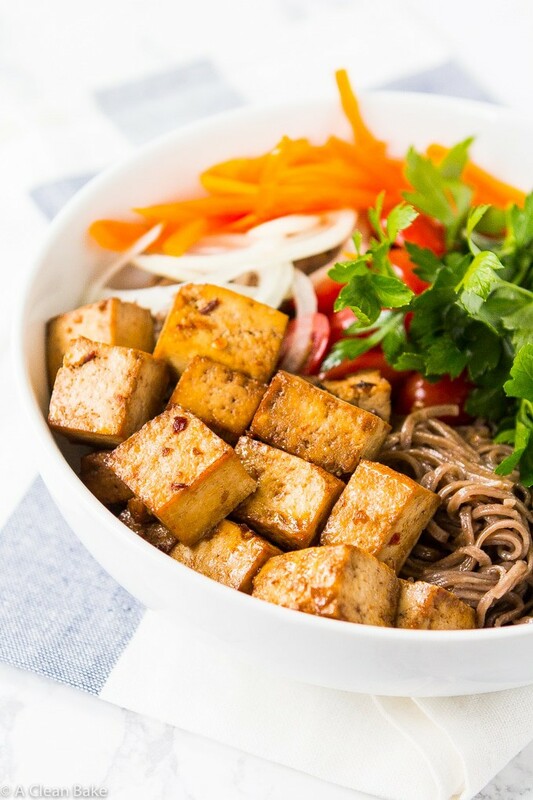 Plus, scroll to the bottom for five quick and easy tofu recipes that you can make with this baked tofu to make #meatlessmonday a breeze! No, I haven’t been abducted by aliens. It’s still me, just… with tofu. Once upon a time, I was a vegetarian. It was the late 80s, and I hated sloppy joes. I mean, what’s the deal with sloppy joes, really? The name alone is such a turn off. Why do you want to eat something that sounds like a hungover frat brother? I digress. They genuinely were revolting. My brother and I had a babysitter who would force me to eat these icky, gloppy, messy sandwiches semi-regularly, and to this day, I’m not sure why. They were gross and I cried. It was pretty predictable. Anyway, I pretty much haven’t eaten ground beef since. The hamburger recipes on this site are approved by my husband; I make them for myself with turkey instead. Once I stopped eating beef, it was a quick domino effect to full on vegetarianism and I pretty much survived on white-bread-and-cheddar-cheese sandwiches for about 10 years, with tofu for some protein. I wouldn’t recommend it. After a tofu hiatus, this baked tofu brought me back into the fold. But the fact remains that tofu is an affordable and versatile protein source, and my dad – a vegetarian for more than a couple of decades (he was an OG veg!) – comes over once a week to take care of Baby Bake so I can get some work done and, believe me, that means he needs stamina. So I dug this old (and I mean OLD) recipe out of the archives, gave it a bit of a facelift, and plopped it on top of a colorful, veggie packed noodle bowl for him. Fast, easy, made of just a few ingredients that you already have on hand, and ready in a snap. Prepare some rice or noodles and whatever veggies you have on hand while it’s baking, and you’re done. Buy a package of firm tofu; pre-cubed or cube it yourself. Your call. Press it, then put into a mixing bowl. 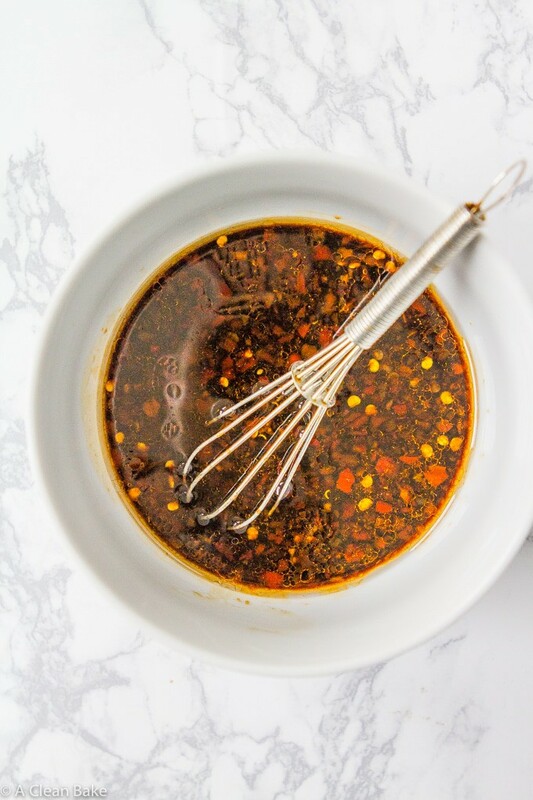 Mix together the marinade ingredients (and feel free to make them your own. Want more spice? Up the hot sauce. Want less saltiness? Reduce the soy/tamari and increase the olive oil slightly), then pour over the tofu. Toss to coat. Bake. Turn. Bake some more. The noodle bowl pictured! Cook and cool gluten free buckwheat or rice noodles and toss them with sesame oil and a dash of tamari or coconut aminos. Top with sliced veggies (e.g. tomatoes, carrots, bell peppers, and pickled onions [leave out the sumac if you’re making them for this bowl]), garnish with cilantro, and squeeze some fresh lime juice over the whole thing before enjoying. Collard Wraps. 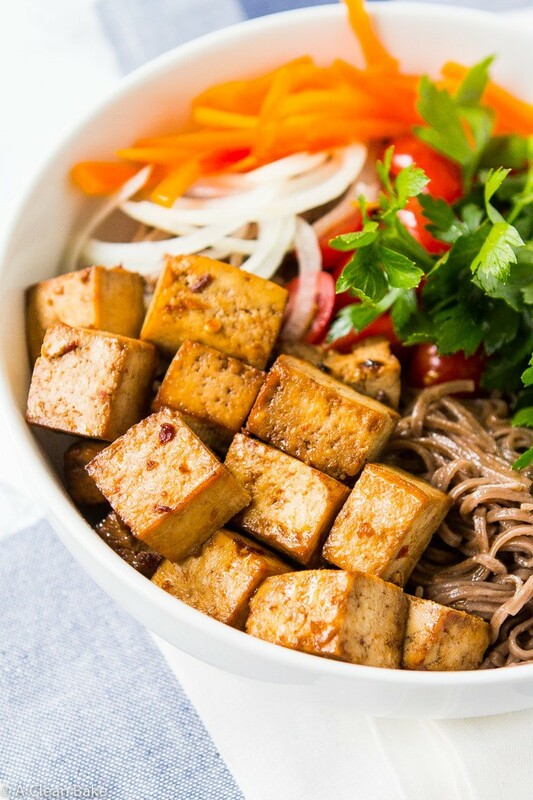 Make sure to cut the tofu into strips, rather than cubes, before baking. Brussels Sprouts Fried Rice, sans spice. Skip the marinate in the recipe, and make this 👆 instead. Toss it in when the recipe calls for the spicy stuff. Vegetarian Banh Mi. Make sure to cut the tofu into slabs, not cubes, before baking. The long and the short of it is this: don’t you dare buy a tofu press. It is a total waste of money and what Alton Brown would call a unitasker, a category of kitchen gadget that I thoroughly believe should be kept to a minimum. Start with a package of extra firm tofu. Use a knife to cut a 1″ slit in the packaging, right next to the seam where the cellophane top attaches to the hard plastic container. Hold the container over a sink to let the water drain out of the package and then gently press on the package to get any excess out of the block of tofu. Remove the cellophane top of the container completely and remove the block of tofu. Wrap the block of tofu in a paper towel. Then wrap it in a clean kitchen towel. Then wrap it in another one. 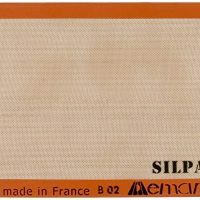 Place it on a firm, flat surface. A cutting board will do. Carefully stack a few heavy things on top. A small cast iron skillet with a few things inside works. I usually use 4-6 overturned (for better balance) salad plates. Just be careful that you have balanced the pressing implements well, so that they press evenly and stay level as the tofu contracts. Now you’re ready to slice and proceed with the recipe! How to tell when the tofu is pressed enough? 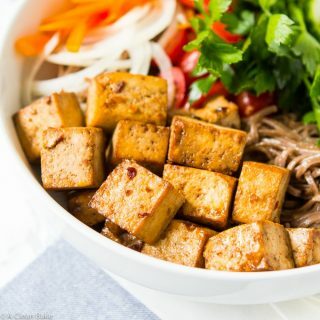 Assuming you have enough weight on the tofu, pressing it for 10-15 minutes is probably enough but 20 is ideal for crispy tofu! You’ll know it’s done when the block of tofu looks very dense and compressed, and probably takes on an odd shape. If any liquid is dripping from the tofu (not the towels, but the tofu itself) when you grab it to pick it up, it’s not drained enough. Ok, this is a little different than what we usually talk about on ACB, but this was too good not to share. There isn’t really too much to say about it besides that it is crispy and flavorful and so astonishingly easy to make, and for those of you who have emailed me and asked where your beloved tofu recipe disappeared to – here it is again! Sorry for the panic. For the rest of you, did you catch the part where this tofu has its own fan club? That’s how good this tofu is! 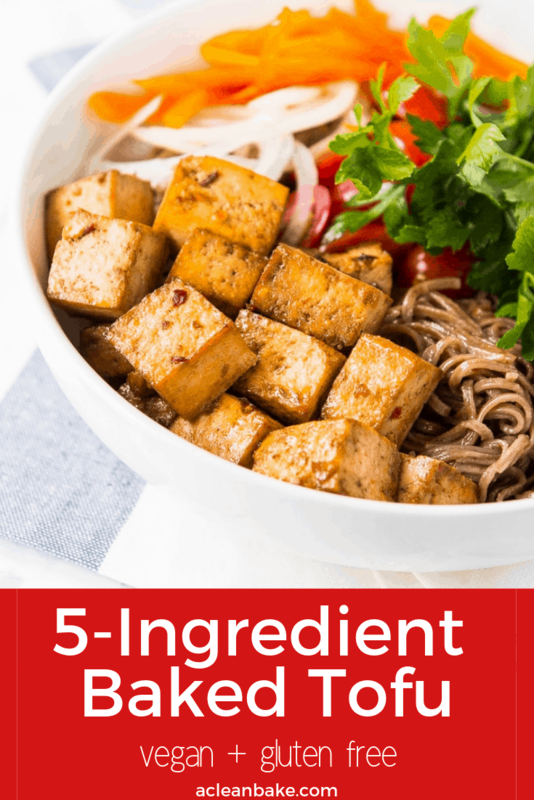 This vegan 5-ingredient baked tofu recipe is a quick and easy plant-based protein that tastes great! It comes together so easily: just whisk together a marinade, soak the tofu, spread the tofu on a pan, bake and enjoy! It comes out of the oven crispy, flavorful, and ready to add some zing to salads, noodle (or zoodle) bowls, sandwiches, and more. Preheat the oven to 400F. 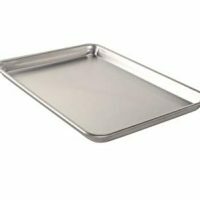 Cover a cookie sheet or backing dish with a nonstick pad and set aside. Drain the tofu, wrap it in a clean towel and then press it for 15-30 minutes. Once tofu is thoroughly drained, cut it in half widthwise, then cut each half into 16 pieces. Transfer the cubes to a large mixing bowl and set aside. In a small bowl, whisk the rest of the ingredients together to make the marinade. Pour the marinade over the tofu and toss to coat. Let sit at least 30 minutes. 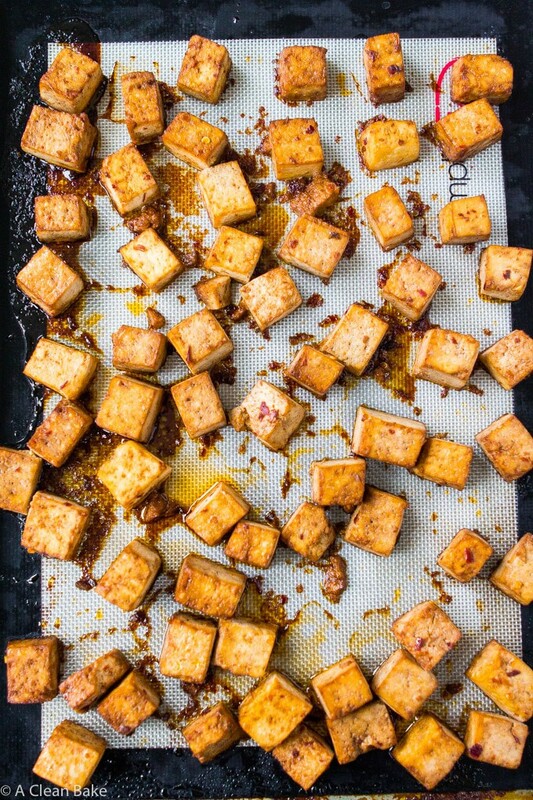 Arrange tofu in a single layer on the prepared baking sheet. Bake for 10-15 minutes, then turn the cubes and bake for an additional 10-12 minutes until crisp. You can sub honey for maple syrup if not vegan. The original recipe calls for olive oil instead of sesame oil. I like sesame oil for a little extra flavor complexity, but use whichever you prefer. Wrap the block of tofu in a clean kitchen towel. Then wrap it in another one. Carefully stack a few heavy things on top. A small cast iron skillet with a few things inside works. I usually use 3-4 overturned (for better balance) salad plates. Just be careful that you have balanced the pressing implements well, so that they press evenly and stay level as the tofu contracts. Now you're ready to slice and proceed with the recipe! 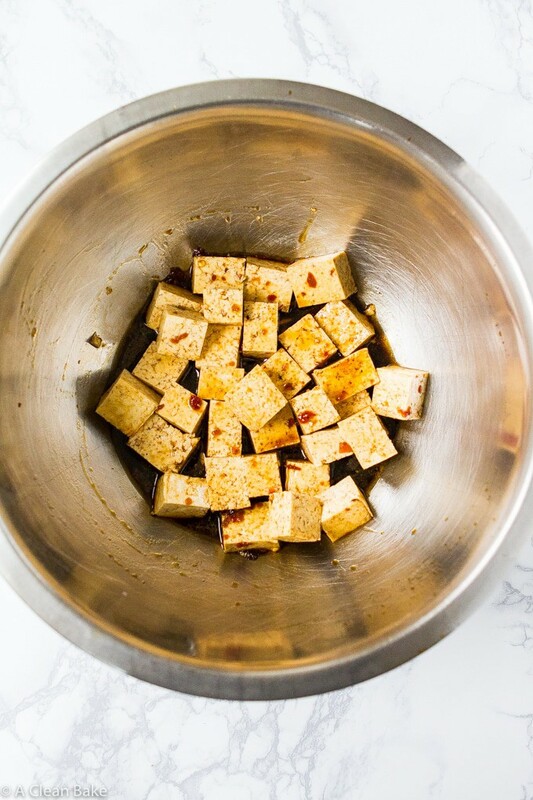 If time permits, marinate the tofu for an hour or two (or whatever time you have) before baking. Store leftovers, covered, in an airtight container in the refrigerator for up to a week. Honey is not vegan. Please stop perpetuating this nonsense. It’s confusing to people who don’t actually know what veganism is. Yep, and that’s exactly why I included maple syrup as an alternative sweetener. You can also use agave if you prefer. However, this is not a strictly vegan site, and many of the readers of the site and comfortable using honey. To each their own. (My comment above has a typo…can this version replace it?) I love this recipe. I usually make it two nights in a row; I use half the tofu one night and the rest the second night. But it would be a LOT easier if I could make it all at once and then not have to do the recipe from scratch the second night. So my question is…can I just bake the tofu and refrigerate the leftover portion? I know tofu, at least uncooked, has storage issues with the whole “change water daily” thing. I am not sure if cooked tofu has similar concerns. 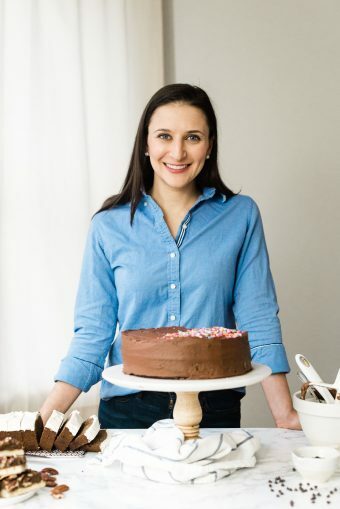 I’m thrilled to hear that you like this recipe so much! I think you should definitely go ahead and make it all at once and eat what you need over the course of the next day or two. I’ve made this again and again and each time I keep leftovers and use them for dishes the next day. Once cooked, the sprouting or whatever the issue is for raw tofu with the water is not an issue. However, it gets a little dried out and gross after a couple days so I wouldn’t suggest cooking more than 1 or 2 days ahead. Also, regarding the raw tofu, did you know you can freeze it? I have used half of a block and frozen the rest (in water) or bought several packages when on sale and frozen them until I am ready to use them. The moisture content gets weird so if you’re going to eat it raw, I wouldn’t recommend this but if you’re baking or frying the defrosted tofu it works great. This looks so good and I love that it’s baked! I bet the marinade gives this tofu SO MUCH flavor. Those chewy glazed edges are to die for! Absolutely LOVE this recipe! Currently chowing down on it as I type. I am curious how to convert kCal to “regular” calories? Im following a pescartarian/vegan lifestyle. Very little dairy. Heavy on veggies/legumes/etc. Looking forward to perusing the site. Hi Bethany! Actually kcal = calories! When we talk about calories, we generally shorten the term, but the real/scientific term for those units of energy is kilocalories (abbreviated as – you guessed it! – kcal). My daughter and i can not eat very icy, so I halved the amount of sriracha. Turned out great. Made it and loved it! The foil did work; no sticking. I think I would do slices next time though; a little tedious and time consuming turning the small cubes. Thanks! So wonderful to hear! Thank you for letting me know! super salty, 20 minutes to drain was good. I used a cloth diaper inside a hand towel under a heavy object to drain. Will try again with a different marinade. The edges were crunchy. Some ate it, some didn’t. Thank you for the recipe. Yes, it is a marinade that is based in a saltier flavor. If you’re sensitive to salt, this might not be for you!